Eyes can be the most challenging part of a face to paint. It is often said that if an artist can capture the eyes appropriately, the artist can make the portrait resemble the person he's painting. Luckily, acrylic paint is the perfect medium for a detailed subject like eyes, because acrylic tends to be smoother and less thick than oil paint. In addition, the fast drying time of acrylic works in favor of a complex subject like eyes, where the artist will want to go back over the painting many times to fill in details at different stages of the painting. Find a picture of eyes that are appropriate for the painting you'd like to do. Keep in mind that a straight on view of the eyes, instead of a view of a face angled to the left or the right, will be easier to paint. 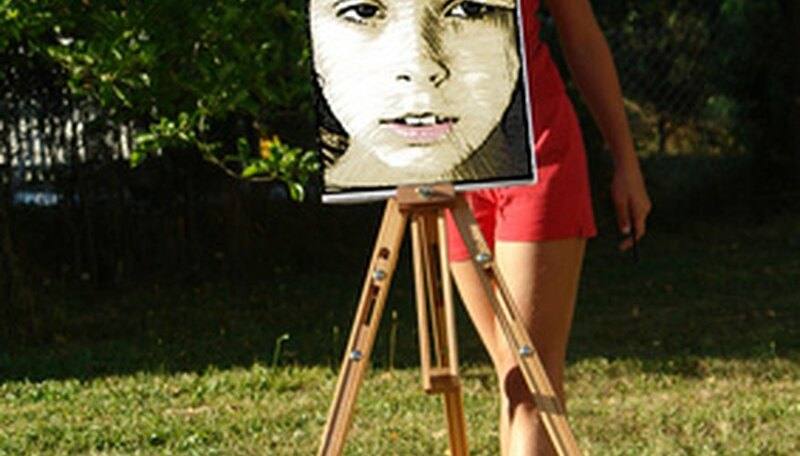 Tape the picture of the eyes to your easel in a place where the photograph will be easily visible as you paint. Draw a line straight across the face where you'll be placing the eyes. Use this axis as a point of reference to keep the eyes straight on the face. Draw the outline of the eyes on the canvas. Use a pencil to outline the almond shape of the eyes. Look back and forth between the photograph and the canvas as you do this, and compare the shape of the eyes in the picture to the shape you have drawn. Inside the almond shape of the eyes, draw the sides of a circle to represent the irises. Allow the top and bottom of the irises to disappear behind the top and bottom eyelid. Mix a color that is mostly white with a hint of blue. This is the white of the eyes. Dip your small paintbrush into the white color you've mixed, and paint the insides of the eyes on either side of the iris. Don't worry if you go over the lines on your canvas. This shouldn't affect you too much because you're painting with acrylic, and your paint should be dry in just a few minutes anyway. Once the paint is dry, you can paint over any areas where you went over the lines. Either way, be sure to cover up the pencil marks on the canvas while you're painting because you don't want pencil to show through the paint. Mix a color on the palette that is the color of the eyes that you'd like to paint. Use a small brush to paint the inside of the irises to the white of the eyes. Mix a color on your palette for skin tone. Lighter skin tones are made by mixing combinations of red, yellow, white, brown and a little bit of blue or green. Darker skin tones are made by mixing combinations of brown, blue, yellow, red and a little bit of white. Note that this color will dry on the palette quickly, so mix enough paint that you'll be able to cover the entire area around the eyes adequately, but don't mix much more than you'll need because it will go to waste if you don't apply it to the canvas. Apply the paint to the canvas around the eyes with a medium sized paintbrush. Mix the color of the pupils by combining a dark brown with a dark blue. If the irises are now dry, use a detail brush to paint the pupils over the center of the irises. Smaller pupils indicate that the figure is in direct light, and larger pupils indicate the figure is in shadow or low light. Mix the color of the pupils with a little bit of paint from the skin tone if hopefully it's still wet enough to mix. Then with a detail brush, paint an arc parallel to the top of the eye, to indicate the top of the eyelid. Mix the color of the hair for the figure. This will be used for the eyelashes. Use a detail brush to paint the eyelashes on the eye after you make sure the flesh tone on the canvas is mostly dry. Start a single eyelash by placing the detail brush somewhere on the top of the eye. Paint a single vertically oriented curved line coming out of the top of the eye, and extending just behind the top line of the eyelid. Repeat this all along the perimeter of the eye, in order to paint the eyelashes. Paint smaller eyelashes along the bottom perimeter of the eye. There should be fewer eyelashes along the bottom of the eye than along the top of the eye. Use paintbrushes to mix your colors on the palette, or use a palette knife. For very fine lines in the painting, as in the case of painting the eyelashes, thin the paint with a little bit of water in order to allow the paintbrush to skim the surface of the canvas with less resistance.